View More In Car Speakerphones. Beautiful look and smooth performance -it can be compatible with all Bluetooth headset enabled devices, and it can connected with two smart phones at once. 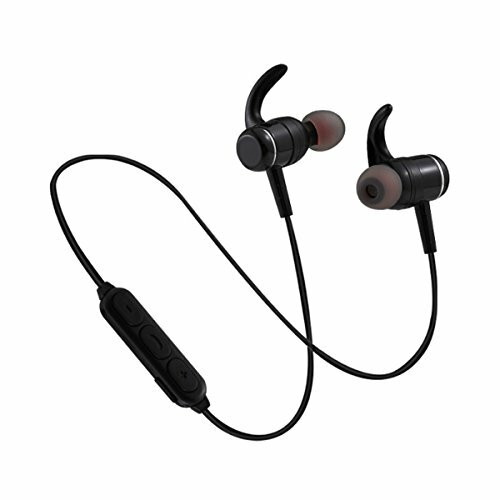 headset lets you enjoy sounds on-the-go, comfortable and snug fit make sure the headset stays put when you are out running ,jogging or exercising. -Specially designed improves signal strength and tolerates more interference, your music becomes smooth without noise or breaks .when taking phone call with the built-in microphone ,your voices are clearer and easier and easier to be heard. headphones fully function even when dripping with sweat; offers sweat-resistant protection while running, biking, training, jogging, hiking, exercising with them in your ears. QUICK CHARGE WITH UNIQUE CHARGING BOX: Portable charging case is ultra-lightweight with large capacity Lithium batteries, which can support 2-4 time fully charging for the wireless earbuds and let you enjoy more than 2-3 hours continuous music or talking time after each single charge. Only takes 1.5 hours to fully charged. Never worry about low battery when you are out all day. Easy to carry, NO Loss. SHARING & ENJOYMENT: One ear or both. One person or two. Use them separately or share with friends so no one misses out on true wireless sound and enjoy together. BUILT-IN SENSITIVE MICROPHONE: The sound is crystal clear with built-in sensitive microphone for in-car calling, stealth listening, or watching videos at work or in the office. Easily switched between voice call and music. If you have any questions about this product by RK, contact us by completing and submitting the form below. If you are looking for a specif part number, please include it with your message.